To make them use to it’s important to start adding a significant amount of water in their diet. Through this, their intake of eating and drinking would be sufficient, and you will have control over it. In case of excessive consumption, you can reduce the amount as per requirement. Whenever you cut fruits for your dogs, you can soak them in water or just make a fusion of 2-3 fruits. This would be useful for them in the case of digestion, and they will have an equal amount of water while having fruits. It’s a kind of special treat which is having vitamins and minerals. Somehow old and broken pot can be a reason of minimum water intake, and this is the fact which we don’t bother. You can try out funky style bowls for them. These fashionable design will help them to interact with their bowls, and you will see water consumption will be greater than their earlier routine. Providing water through only containers would make your dogs uninterested, and he will get bored too. So it would be better to try out some different ideas you can install pet water fountain because like human beings pet also like to have fresh things so it would be more interesting for them. They usually love to have water from swimming pool and puddles. Straightaway water will be tedium for your dog you can try out some flavor with water. Low sodium chicken stock with plain water would be good for their health and taste as well. It will entice your dog to drink more flavor water in a yummilicious way. 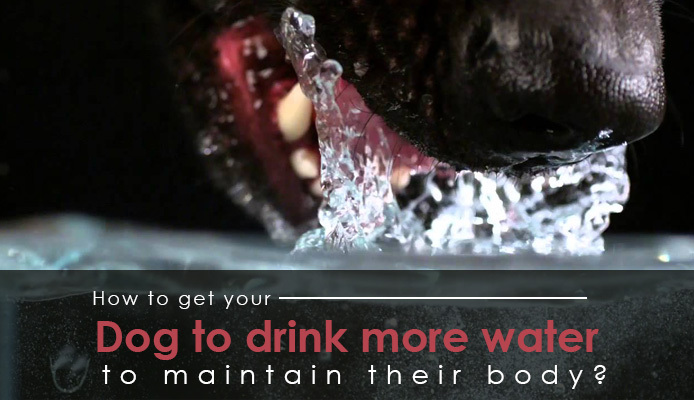 These are some possible ways which would help you to increase your dog’s water consumption. Now you don’t need to worry about you just need to try out these tricks. Don’t use water straight away just try to give them with fruits and vegetables which would make water consumption equally for them.